It’s just not Christmas without some Peanut Blossom Cookies. I’ll say right off the bat that I have no claim to this recipe other than the fact that I’ve eaten my weight in them over the years. Any combination of chocolate and peanut butter in the form of a cookie makes this southern boy very happy, and these cookies are at the top of the list. I decided to post this ubiquitous recipe after reading an article on this history of this cookie. 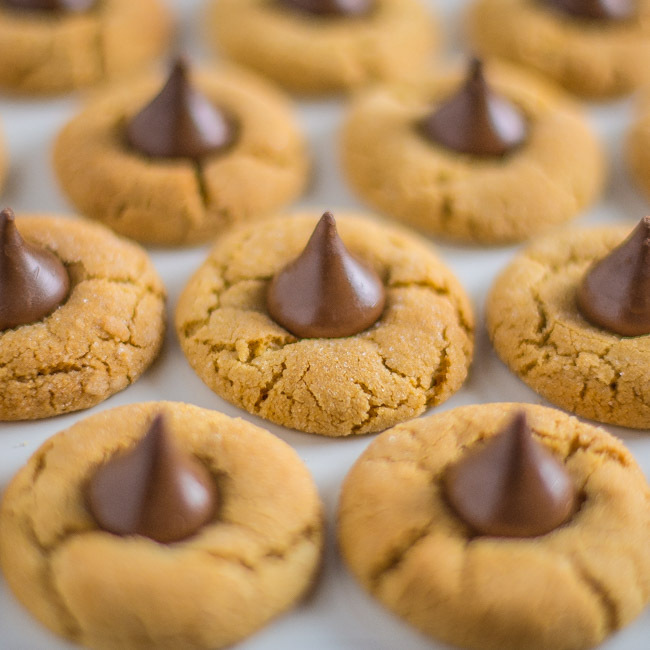 Freda Strasel Smith made the first Peanut Blossom Cookies in 1957 almost by accident. After making her cookie dough, she went to her pantry and realized she didn’t have any chocolate chips. She did, however, have some Hershey’s Kisses, and in a stroke of genius, she decided to place a Kiss on top of each cookie as they came out of the oven. Later that year, Mrs. Smith entered the recipe in the Pillsbury Bake Off where she was a finalist. Pillsbury flew her to Beverly Hills for the competition and ultimately the Peanut Butter Blossom cookies came in third place, winning her a General Electric range, a mixer, and $100 in cash. In 1999, Pillsbury named the Peanut Blossom Cookies one of the ten most treasured recipes in the company’s history. This recipe makes forty-eight cookies, and I’m in danger when that many cookies are sitting around in my kitchen. Willpower for resisting cookies is not one of my strong suits, so tomorrow I’m making some friends happy with a Christmas cookie delivery. 1. Preheat oven to 375 degrees and adjust rack to center of oven. In a medium bowl, whisk together flour, baking soda, and salt. 2. In the bowl of a stand mixer, cream butter, peanut butter, 1/2 cup granulated sugar, and brown sugar together on medium high speed for 2 to 3 minutes. Reduce speed, add milk, vanilla, and egg and continue mixing until well combined. 3. Add flour in batches letting each batch incorporate before adding more. 4. Place 1/4 cup sugar into small bowl. Roll dough into 1 inch balls and roll in sugar. Place balls 2 inches apart on a large ungreased baking sheet. Transfer baking sheet to oven and bake for 10 to 12 minute until cookies are golden brown. Remove from oven. 5. Top each cookie with a Chocolate Kiss, pressing slightly into the cookies. Transfer cookies to a baking rack and cool completely. Whoa! Talk about a blast from the past. This certainly is it! I love these cookies! I hope you had a terrific Christmas, and i send my best wishes to you and yours for a happy and prosperous 2015! These are one of my favorite holiday cookies. I know they can be made all year but, it seems this time of year is when I enjoy them the most. Thanks for reminding me that they are easy to make. I agree with you, Velva. They’re one of my favorites too and they’re perfect for Christmas. I hope you and your family have a great Christmas! Hey Brett! So good to see your comment. No worries about being MIA. I have been too, I’m afraid. Life keeps getting in the way of my blog reading. It’s all I can do to keep up with my own! 🙂 I hope you have a very Merry Christmas and a great 2015! PB cookies aren’t my favorite choice, unless someone presents a plate of these. PB and chocolate is a great combo. Wishing you a wonderful holiday season. I agree about PB and chocolate, Debby. That combo can’t be beat. I hope you and your family have very happy holidays! I love that these are easy to make AND that hey make so many! Want to deliver to my doc’s office & family members … If I make 2 batches, it’s a done deal for everyone! I’m definately feeling thankful for these!! Thanks so much for your wonderful recipes through the year & all photographed beautifully! Merry Christmas a safe, happy New Year! Thank you so much, Bert. Glad to see your comment. I hope you have a wonderful Christmas and a fantastic 2015! I love the idea of your weight in these. I’ll take that. I had no idea the history behind these, but I certainly have had my share of these in my day as well. Great photos. Pinned! Thank you, Katie! I hope you and your family have a great Christmas!